Looks like communications are about to be decentralised. Encrypted Internet traffic surged worldwide after the Snowden revelations, with several developers releasing new tools to enable people to better protect their privacy. Today BitTorrent Inc. contributes with the release of BitTorrent Bleep, a communication tool that allows people to exchange information without the need for any central servers. Combined with state of the art end-to-end encryption, the company sees Bleep as the ideal tool to evade government snooping. 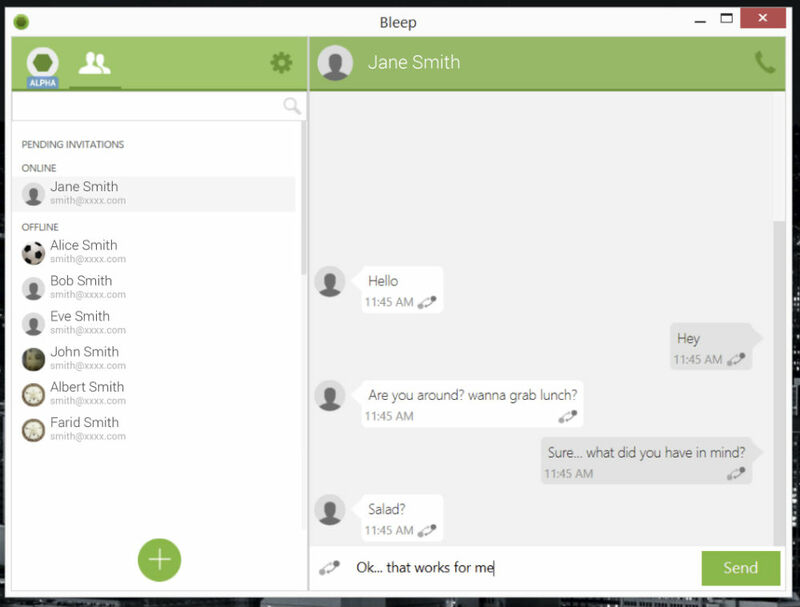 Bleep’s main advantage over some other encrypted messaging applications is the absence of central servers. This means that there are no logs stored, all metadata goes through other peers in the network. “Many messaging apps are advertising privacy and security by offering end-to-end encryption for messages. But when it comes to handling metadata, they are still leaving their users exposed,” BitTorrent’s Farid Fadaie explains. Speak Freely – It’s Person to Person. The BitTorrent Bleep Pre-Alpha will be available on Windows desktop to start. Easy to use, Bleep offers freedom to communicate over text and voice, person to person. Hoping for early access to BitTorrent’s first serverless chat client? We have good news. Today, we will begin letting testers try out the Pre-Alpha. We are also unveiling its name: BitTorrent Bleep. Why Bleep, you might ask? Well, basically, we never see your messages or metadata. As far as we’re concerned, anything you say is “bleep” to us. And with the susceptibility of communications platforms to snooping and hacking, reminders of which seems to surface every week, we realized that we were uniquely qualified to build a better platform and application. In other news, the NSA has redesignated the name of its largest surveillance division "Whack-A-Mole". But if there's no central server, how does the client know where to find other peers? It's P2P, so it's using peers to communicate that information. All of that can be cryptographically and securely done. This actually seems a bit similar to Bitmessage, although there are significant differences. This seems like a bit better solution for chatting. I think I'll give it a year or so to see if some security researcher doesn't figure out a way to compromise it. Here's the real problem as I see it: we are running programs on machines engineered and built by the largest "in bed with the government" corporations in the world; 90% of which are running an operating system known to be compromised; on a network controlled by the governments of the world; over wired connections and radio waves monitored by the governments of the world (and their corporate allies). Not to discourage people for trying (because it's important that they do) but seriously - who is kidding who? It's not the governments and the corporations that are playing Whack-a-Mole when it comes to stuff like this. Again: This is not a technical problem. It is a people problem. People problems can't be fixed by simply applying some technology. We need to stop trying to take the easy way out by hoping for a cheap technical fix. We need to sit down, address, and ultimately deal with the real problem here. That's the only way this is ever going to be resolved. IMHO, things like Bleep mainly serve as a distraction to keep us from dealing with the real problem. Yup. It's never a tool problem. It's ALWAYS a people problem. e.g. Guns, booze, drugs, etc. e.g. Freescale is drooling over tracking chips and "The Internet of Things" (IoT). IoT is the end of privacy if the tools are controled by psychopathic control freaks. There are some great things that you can do with IoT, but... do you trust the people who will deliver it or regulate it? Cryptography is the art of not trusting anyone. We are fools if we trust them. All the more reason to adopt proven trustless environments and get rid of government entirely. I so hope you are wrong. That's just utterly depressing. I'm still hopeful and cheering for the cryptoanarchists out there. For the record, I am utterly depressed about all of this. And I so hope that I'm wrong too! Still, if you expect and plan for the worst - but hope for the best - you can usually drag yourself through yet another day. Yet I suspect we both know he's right. As do I ... But a little piece of me died - Part of my inner child that still clings to silly things like 'Hope' - when Anonymous went under. I thought the Bleep invite was was interesting. I mean, how do the peers know how to find each other? How does my computer know to connect to someone on the other side of the world unless we both connect to a central server that tells us the other person is running the client? You would have to communicate your IP addresses to each other first. That's how SpeakFreely works, anyway. Yeah, but how does the client know who to communicate your IP address to? Or do you mean we'd have to manually tell each other our IPs and manually enter them into the client? ExtremeTech did a writeup on it here. It's not completely secure or untraceable by any stretch. It just makes it more difficult (in theory) to do so. Like I said earlier - it's Whack-a-Mole. But it's questionable just who's playing whom. Oh wow, BitTorrent notices that decentralized P2P is the way to go. We eMule'rs yawn silently. Seriously, what difference does it make whether something is "new' in the absolute or relative sense? Everything is bound to be 'new' to somebody. Why is it so important to establish who supposedly "heard it first" or "did it first?" Most people could not care less. I know because I happen to be one of them. Bittorrent is a hype. I'm slightly angered with aversion about hypes. I never was into pop culture. Of course it is. But again, so what? Bleep is a "wrong approach" to dealing with the problem anyway. Hype or no hype. Let them dream their dream. Nowadays, every government seems to be interested in what we're saying online. Tox is built on a "privacy goes first" agenda, and we make no compromises. Your safety is our top priority, and there isn't anything in the world that will change that. And when they say "totally free" they mean open source, too! They have downloads available for multiple operating systems, including Windows, OSX, Linux, and Android! Yeah, but how does the client know who to communicate your IP address to? ... like a torrent. There are trackers that know the locations of peers holding data. But they don't know what the content of the data is. And when the actual data of a message gets transferred, it's done peer-to-peer so there's no metadata passing through a central server where it can be easily intercepted. ... actual communication takes place directly between the parties themselves. Are those trackers run by Bittorrent Inc? BTW does the peer matching for Bittorrent Sync work the same way? Some write ups claim that Bittorrent Sync is more secure than Dropbox since the data isn't cloud stored. But if the client matching happens in the cloud a powerful agency could require the cloud operator to hand over the secret key and then use the key to access the Sync folder directly on the client. Likewise a malicious employee who previously would try to circumvent company security to access a client data item would now instead try to circumvent company security to get the client's secret key and with it get the data directly from the client. Bittorrent saves money on not having to host and transfer the data and client may see higher speeds. But is it in practice any more secure than Dropbox style services? Interesting question, didn't really think about that. I use btsync and it's great, I love how nothing is stored in the cloud. TO answer the question, I think I'll reference 40hz' posts regarding privacy and how there basically is none in the current computer/internet setup, and it's a game that we're just playing amongst ourselves in a system that is already compromised. Yeah Bittorrent Sync is great. Very simple to use compared to fiddling with a ftp server/client setup. And who knows maybe they have some solution to the question I posed. But it puzzles me that articles I've read on it doesn't ask about that, for example the MIT Review article "Sync Your Files without Trusting the Cloud". The answer is probably the obvious one. There are 2 levels of privacy here, incidentally it has always been 2, not just in NSA days. I think it will be a good thing to see multiple programs doing the same thing there. Competition is good. Bittorrent has a big name though, so that's not going to work in their favour for Tox. Some recent new prompted BT to write this explainer that answer my old question above about Bittorrent Sync. Thought others might find it useful. Page created in 0.041 seconds with 69 queries.